Looking at the outside, we can see the translucent turret, which lights up on priming or firing. 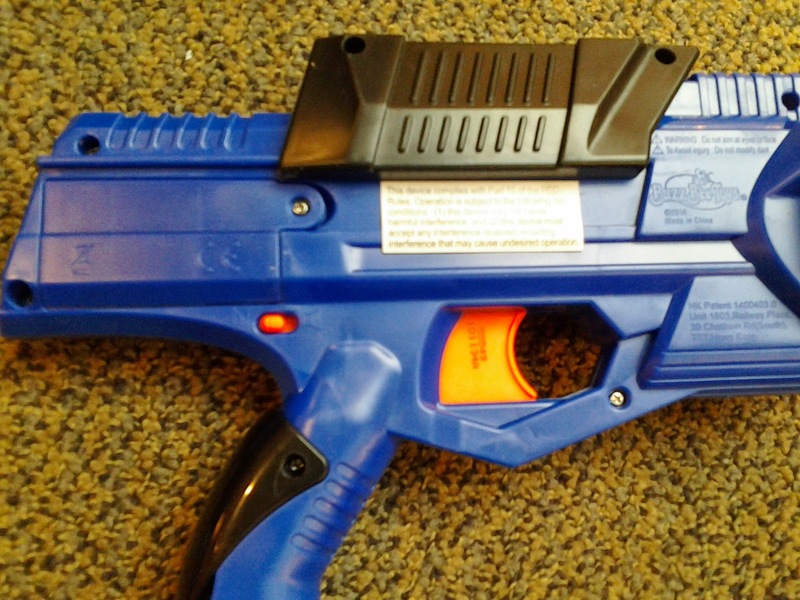 Turn the blaster over, and you can see two things: the battery compartment, and a switch for the special effects. Yep, the light and sound is optional, NOT mandatory. That's a least an improvement over the old Buzz Bee Thunderbolt. Now let's take all of those screws out! 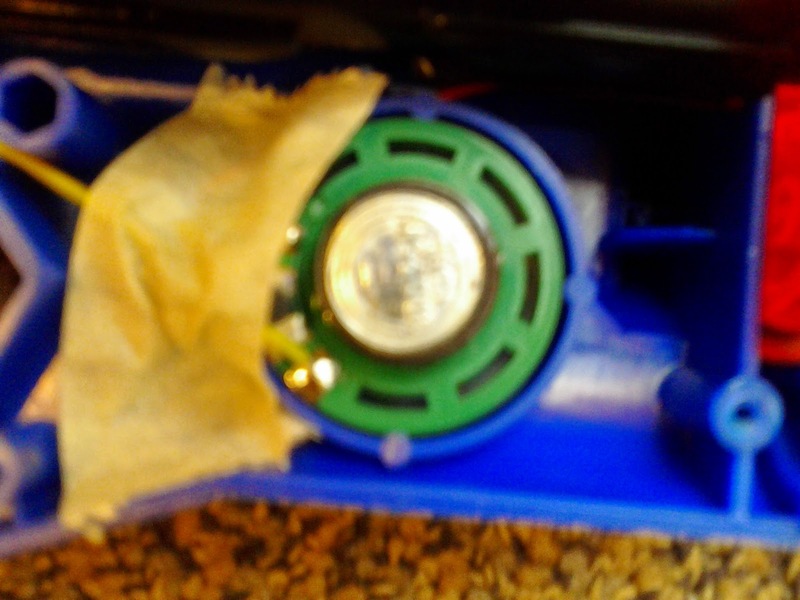 Note that the battery tray is in one half of the shell, while everything else is in the other. So don't just yank the two ides apart. Also notice the lack of extra parts usually seen in Buzz Bee pistols. This tiny light at the back of the turret makes the entire thing glow. 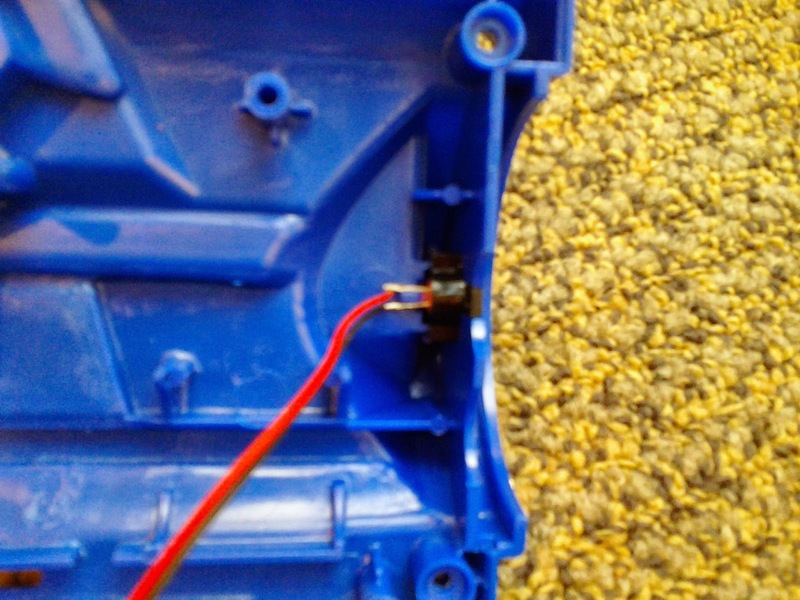 This is the small speaker for making the futuristic blaster noises. Someone needs to splice the headphone wires into a headphone plug, just so we can throw in a small MP3 player and have a few laughs! Finally, here's the back of the propulsion system. 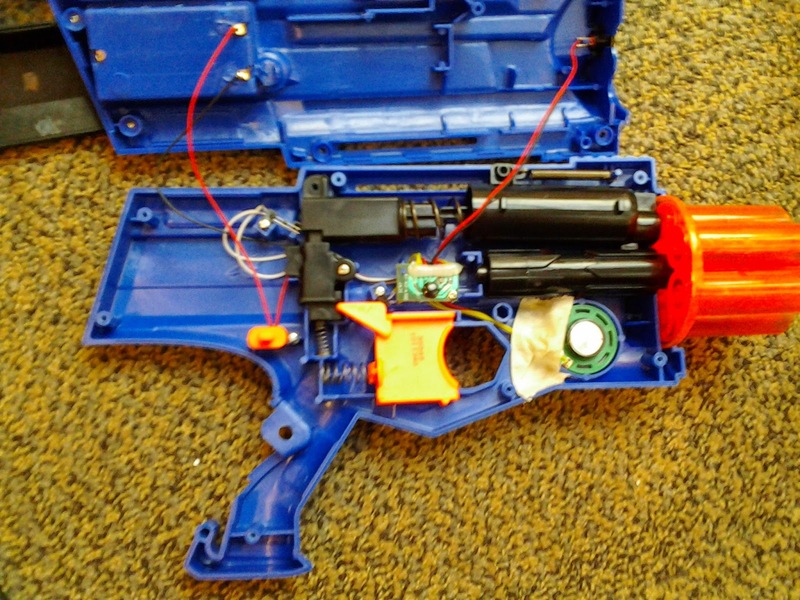 It's identical to the one used in both the Jaguar and Cougar clip-fed blasters, where you prime the blaster by physically moving the plunger tube back until the plunger engages the catch-piece. A tab on the plunger tube meshes with the turret rotation mech. It's a system that works extremely well. 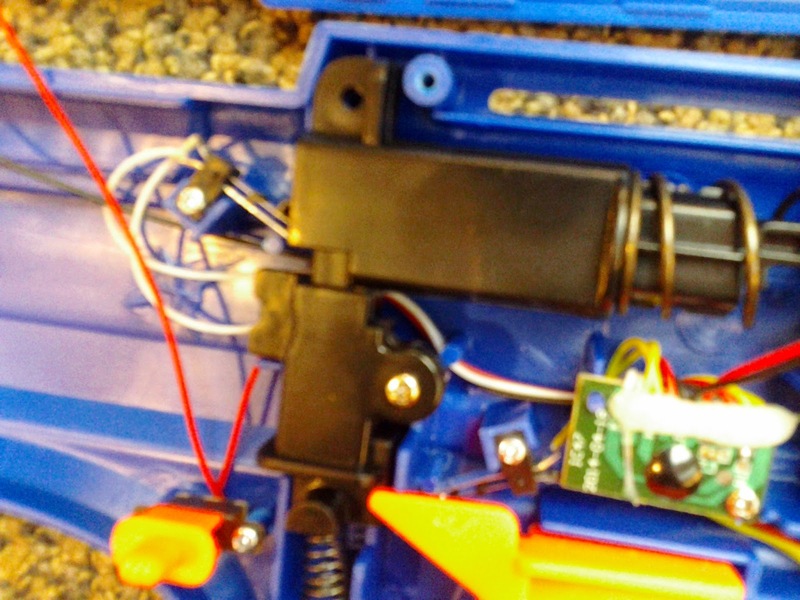 You can also see the two switches for the electronics, one by the trigger and the other behind the catch-piece. These switches are what activate the different effects. Overall, the Sonic 6 is an improvement on its predecessor in terms of internal simplicity and in special effects (the OPTIONAL special effects). 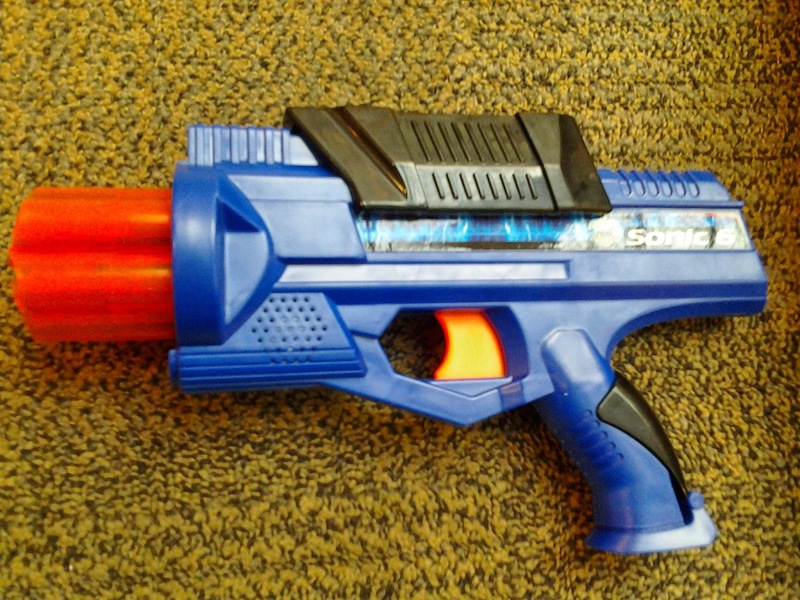 However, it is still marketed primarily as a blaster, and is seen with all the other pistols in the Nerf aisle. 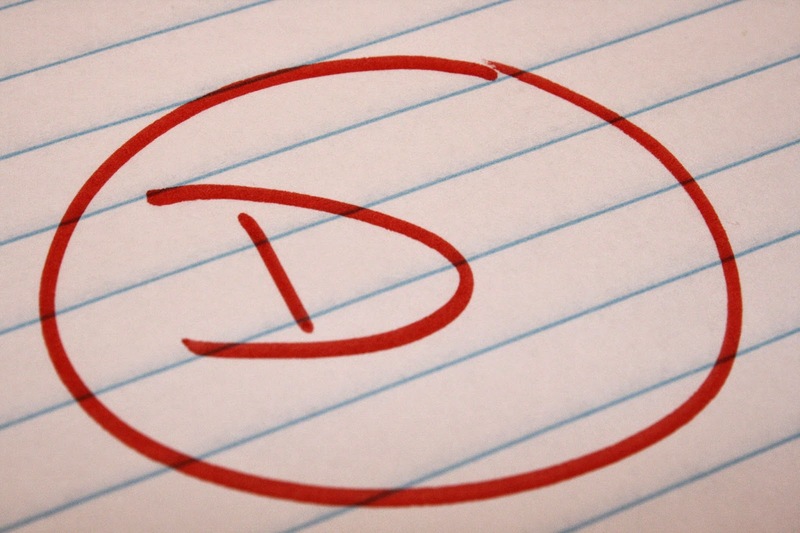 Which immediately raises concerns since the $10 price tag only carries a 30' range claim. Fired flat, the Sonic 6 almost reaches 30', while angled ranges produce ~50' results. 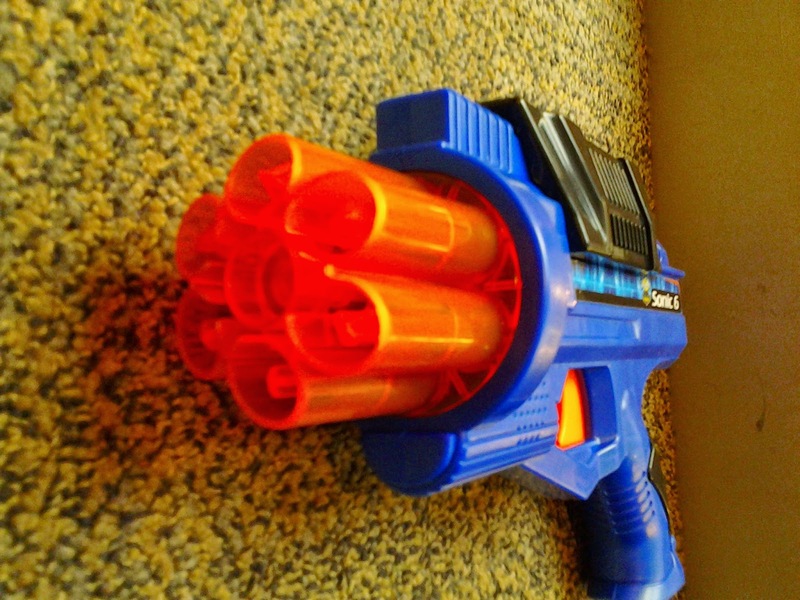 This occurred both with the included darts and with Nerf Elite darts. It's just not that good a blaster in stock form. I'm sure modification would make it perform better, but that's extra time (if not money) when a Nerf Strongarm or Buzz Bee Air Max 6 can offer much better performance in a same price ballpark. Unless I find some unexpected gift within the shell of this blaster, I'm going to have to recommend taking a pass on the Sonic 6. It shoots darts as far as it says, but is pathetically outclassed by the blasters sitting right beside it in the toy aisle.